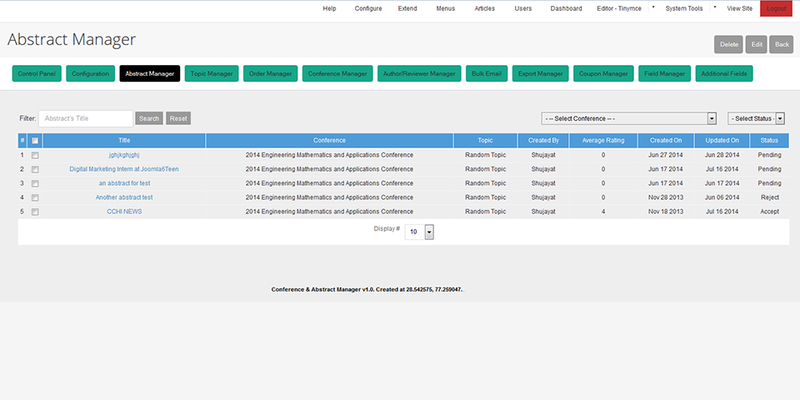 The Conference & Abstract Management platform lets authors submit & manage their abstracts online and allows attendees to register & make payment for your conference. It also has a very expansive Reviewer Management System enabling reviewers to assign, review, reject and recommend submitted abstracts. Frontend Dashboard is for Authors to Submit abstracts, PDF files and information add other participating authors, and for Saving and Editing the abstract submitted. Admin can set a Last Date for Abstract Submission and prevent authors from editing the abstract. Control Panel for Reviewers to Review abstracts. Reviewers can review abstracts, leave their comments, accept or reject the abstract and notify authors. Admin can assign multiple reviewers to an abstract or multiple abstracts to a reviewer. Editors can export a single abstract or all abstracts into CSV format and view it in Excel spreadsheets. You can also export users (authors/delegates and reviewers) in CSV format and can be used to import into a third party software. Delegates can choose from multiple Payment Methods to pay for Conference registration including Paypal, Authorize.net & Bank Transfer. Automated emails generated for: Authors who sign up for an account; Reviewers who are allocated an account by an administrator etc. 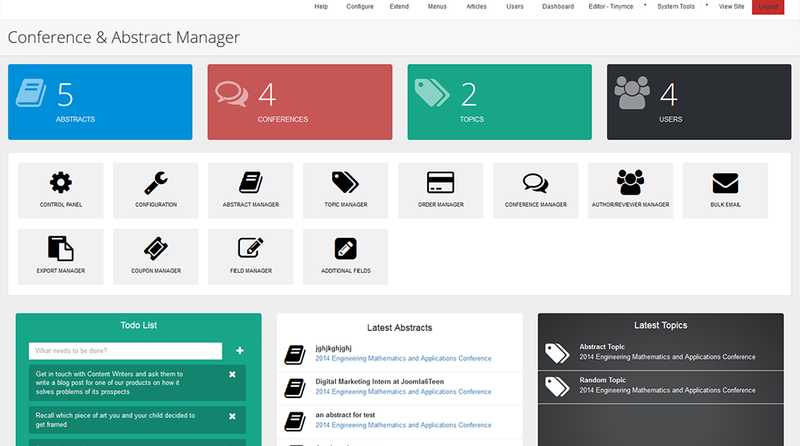 You get a dedicated website for your conference with a dashboard to manage your users, orders, submitted abstracts, event details and other pages. Generate and Download all the submitted abstracts in the form of an Abstract book (PDF version) along with the option to include images, authors details, reviewers and their reviews. 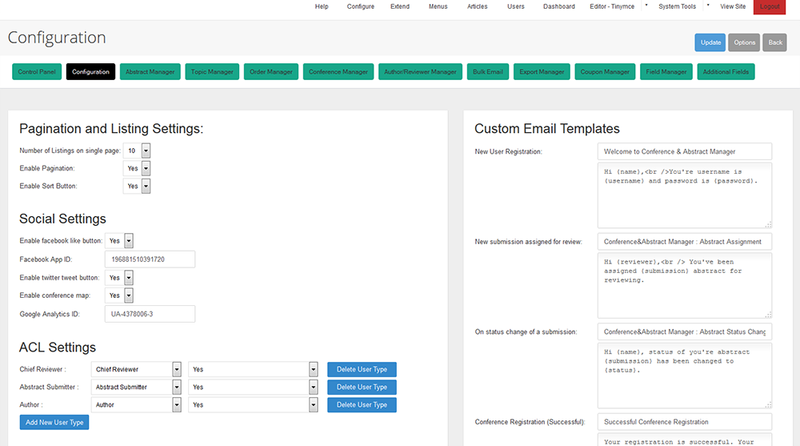 With custom fields, you get the ability to customize the Delegates and Author registration forms by creating your own fields in the registration form for users to fill. 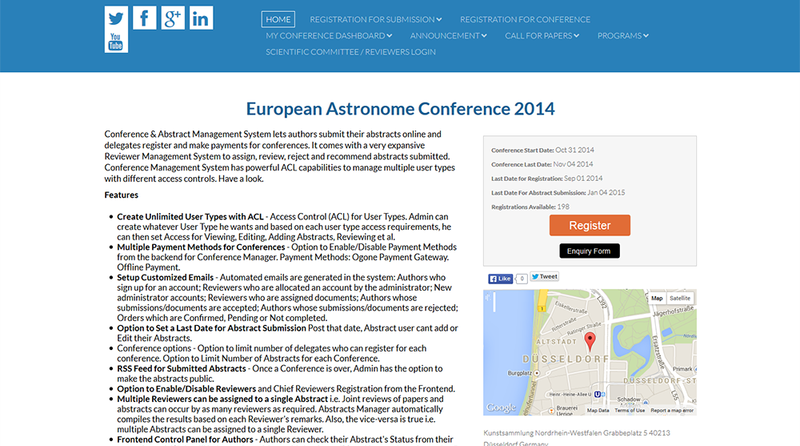 Create customized pricing for delegates paying online viz. Accommodation charges, Traveling costs etc with option to associate them according to different memberships. When an organization grows by leaps and bounds, the requirements grow at the same pace and at times, they’re very specific. To serve these specific needs, we have set up a professional services team which provides bespoke conference management platforms to our fast-growing customers. Get in touch with us to discuss more about your custom requirements and a quote. A faculty from Southampton University has contacted us about using Conference & Abstract Management System for hosting the UK Turbulence Consortium workshop 2014. The UK Turbulence Consortium first came into being in 1995 under the leadership of Professor Neil Sandham, University of Southampton.